Village situated on both banks of the Dnieper river, in the government of Mohilev, in northwestern Russia. Its total population in 1898 was 8,687. Of this number 4,559 were Jews. Dubrovna is known as the first and almost the only place to manufacture woolen ṭallits. This occupation dates back many years. It is known that in 1750 a factory for their manufacture existed in Dubrovna, but they had been made here even earlier. The artisans work in their own homes, and are often helped by their wives and children. There are about 600 families so engaged. The dyers, who dye the woolen thread a dark blue ("tekelet"), earn from eight to ten rubles a month. The more numerous class of weavers, with the hard, incessant work of their families, even of children of six or seven years, earn less than the dyers. The launderers (10 or 12 families), who wash the ṭallits, earn more than the others—sometimes five rubles a week. The shavers ("goler"; about 20 families), who cut the nap from the surface of the ṭallits, receive the least of all. The work is carried on amid very unsanitary surroundings. The peasants are exploited by the dealers who supply them with wool and purchase the finished article. The dealers (there are only three or four of them) have agencies in all important commercial centers, and their agents cover every town and village within the Pale of Settlement. The Dubrovna ṭallit was formerly sold abroad, even in America; but within the last ten years the machinemade ṭallit of South Russia and Lithuania is supplanting that made in Dubrovna. The pitiable condition of the weavers has lately attracted the attention of their Jewish coreligionists. 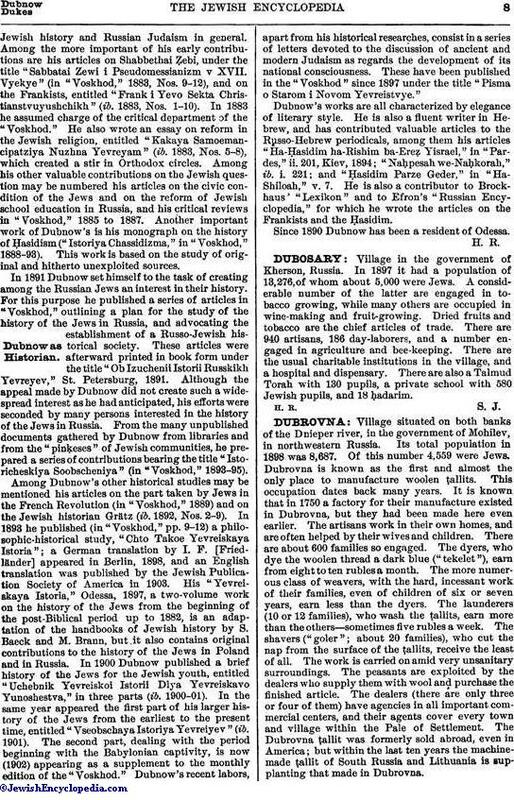 Thanks to the cooperation of the Jewish Colonization Association, several Jewish capitalists have organized the "Aktzionernoye Obshchestvo Dnieprovskoi Manufaktury" (a stock company for the development of Dnieper manufactures), with a capital of 1,200,000 rubles. Two-thirds of the shares have been taken by the Jewish Colonization Association. The ultimate purpose of this undertaking is to reorganize and raise the level of the weaving industry among the Jews in Dubrovna and to furnish employment to those needing work. Besides the weavers there are in Dubrovna 270 Jewish artisans and 24 day-laborers. The local charitable institutions are: a society for the aid of the poor, founded by the governor of the province; a biḳḳur ḥolim; and a leḥem ebyonim. The Jewish children are taught in the Talmud Torah (72 pupils). 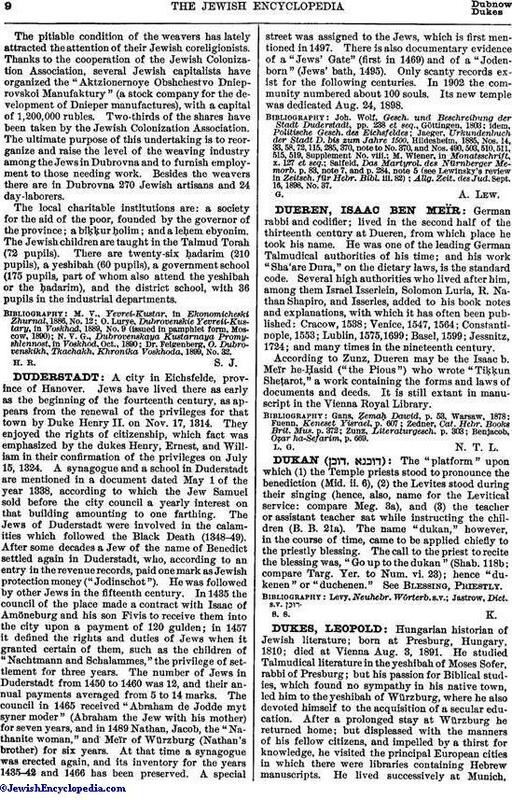 There are twenty-six ḥadarim (210 pupils), a yeshibah (60 pupils), a government school (175 pupils, part of whom also attend the yeshibah or the ḥadarim), and the district school, with 36 pupils in the industrial departments. Dr. Feigenberg, O. Dubrovenskikh, Tkachakh, Khronika Voskhoda, 1899, No. 32.